toward the U.S. ambassador during the standoff. capital, Harare, have had tense relations with the government. The group included U.S. Ambassador James McGee and the British envoy. to hospitals and an alleged torture camp they had just completed. through after about an hour. A police car escorted them back to the U.S.
one of McGee's senior aides. diplomats and journalists on the tour. were also in the convoy. government will have to listen," Mr McGee said. been stripped from their backs. areas and could reach crisis levels," Agustino Zacarias told reporters. people in need and had forced them to scale down operations. of the opposition Movement for Democratic Change. to intimidate opposition supporters before a runoff presidential election. people being hospitalized since the first round of voting March 29. The paper in turn criticized McGee, accusing him of "very scandalous acts"
has riven Zimbabwe since the first round. No date for a runoff has been set. France-Presse correspondent with the convoy said. approval and then found their exit blocked by four armed police. forward and opened the gates to leave the government hospital himself. minor, very minor misunderstanding" with a security officer. what's happening in Zimbabwe," McGee said. violence was "pretty well organised, well calculated and very disturbing." they don't vote," he said. embassy, said she was "shocked" by what she saw in the hospital. like if they make an effort to speak up, to voice their opinions," he added. and opposition leader Morgan Tsvangirai. been visiting the region to garner support for his cause. which could unseat Mugabe after nearly 30 years in power. the rural areas," US embassy spokesperson Paul Engelstad told reporters. opened the gates to leave the government hospital himself. minor misunderstanding" with a security officer. allows them to travel 35 kilometres outside the capital. happening in Zimbabwe," McGee said. happening' ... now we have concrete proof of what is happening," he added. "pretty well organised, well calculated and very disturbing". that Zimbabwe paid US$700 million to the African Development Bank (AfDB). to the AfDB this time around. partners to treat this story with caution. But does the finance minister know? in a brief interview in Maputo on Tuesday. overdue debts to lending institutions. the US $650 000 to pay part of its overdue credit. sovereign state," said Kaberuka in an interview on Tuesday. the remaining debt in the stipulated six-month period. close every little bit of political space in the country,' Mlilo said. tried to notify the police of it's plan to hold the three rallies in Harare. accept the letters from the MDC officials,' a statement from the party said. association and assembly,' the statement added. even wider margin in the run-off. official has been taken into police custody. Jinyika as an outspoken ZANU-PF supporter who has no sympathy for the MDC. had purchased from the Grain Marketing Board. deaths and serious injuries are going unreported in the remote areas. "refugee centres" filled with victims of state-sponsored violence. the party to report that they have been attacked." voters will only be able to cast their ballots in their own specific wards. nation ahead of the so-called run-off." that they are now even more supportive of the opposition. his hospital bed in this farming town, 60 kilometres, north of the capital. to lift up my feet and was hit on the soles," she said. "If police had not come to rescue us, I would have been dead," she said. supporters of the opposition Movement for Democratic Change in rural areas. President Robert Mugabe were defeated. Hitler Muguze, 41, a bricklayer and his wife Anatoria, were also attacked. He said they were never told why they were being beaten. "I don't belong to any political party, but they beat me up," he said. by a Salvation Army mission, on Tuesday, where they chatted with victims. from here I am going to Harare," he said. links to the MDC and their part in voter education programmes. Makoni, who came third in the presidential elections. local government councillor Kapenda Mwanza who had his buttocks butchered. pain in his hospital bed. people in need and had forced it to reduce operations. According to journalists traveling with the diplomats that included U.S.
in Mvurwi, and insisted they be let through. 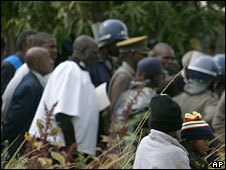 violence to intimidate MDC supporters before a runoff presidential election. hospitalized since the first round of voting March 29.
breaching diplomatic protocol by speaking out on the violence. organization workers have been arrested since the elections. lengthy meetings with President Mugabe last Friday. supposed to take place by May 24 but has been postponed to an unknown date. weekend to prepare for a run-off election, his aide said Tuesday. Mugabe, the date of which hasn't been announced, said George Sibotshiwe. "We are certainly going back this weekend. We may even be back before then,"
majority needed to avoid a run-off. planned to be back home within a few days. modalities of returning to Zimbabwe. said privately Tsvangirai was expected in Harare tomorrow Friday. continue to appeal to the police to execute their duties professionally." run off be held by May 23 and international supervision for the run off. in having international observers because they know that they are thieves." international observers, which the government rejected. a telephone interview. "For us that is sufficient." aftermath of the 29 March 2008 harmonised elections. perpetrator’s affiliation," says the statement . after eight deaths were recorded in the last 72 hours. down a shop belonging to MDC senatorial candidate, Liah Nyathi. spot while Gomwe was axed on the head and died on his way to Gokwe Hospital. and is still in police custody. shops destroyed by the Zanu PF activists. trumped up charges on threatening Zanu PF supporters. after Zanu PF supporters beat him to death at his home in Hopley Farm. Emmanuel leaves behind a wife and a three year-old daughter. village and Ruth Mushayahembe of Chimbwanda village. torched the house of his parents. supporters have also set up torture bases in the area. managed to dismantle torture bases and had intensified their operations. Zanu PF is at the centre of the violence-taking place nationwide. assessment, and we have done that," Zacarias told IRIN. to make it to the hospitals and are still out there in the countryside." conduct an assessment was "being processed". post-election crackdown and is politically motivated. for the first time since independence in 1980 in elections held in March. become an issue of concern. motivated violence without fear of retribution," he said. from which surrounding villages have been intimidated, or worse. volatile Mashonaland Central Province were detained for more than two hours. European Union. Apparently the diplomats had been mistaken for journalists. alleged the other diplomats were his employees." had been tortured by war veterans, ZANU-PF militia, soldiers and police. currency market by Reserve Bank governor, Gideon Gono. cash, by removing distortions between the official and black market rate. terms of penalties provided in the legislation. official banking system over the past week. flogging forex using the parallel market rates. to curb foreign exchange activities in the parallel market. Exchange Control Act and regulations made under it. the Exchange Control Act," said a spokesman. after being given counterfeit notes." business had sunk to rock bottom levels. On Tuesday, the greenback was trading at ZD250 million. What happened in the Presidential Election? When the Zimbabwe Electoral Commission finally announced the results of the Presidential election, quite apart from the relief that they were finally announced, there were two predominant reactions. The first was a total lack of surprise that Morgan Tsvangirai had beaten Robert Mugabe: all the indications from every source, as well as the evident disbelief of Zanu PF and the subsequent shenanigans of ZEC, were that this would be the case. The second reaction was the lack of surprise that ZEC had not announced Morgan Tsvangirai as the outright winner with an absolute majority. It was clear to all concerned that the results were known in detail by Monday, 31 March, and there have been a number of "leaks" to this effect, all suggesting that Tsvangirai won outright. If the Electoral Act had been followed to the letter, then Morgan Tsvangirai would have been sworn in as President of Zimbabwe, and Robert Mugabe would have had no further recourse except by election petition. So, it was clear to all that a run off result had to be engineered, and thence followed the farce of the recount, a wholly unlawful recount according to the Electoral Act. It was also clear to all that there had to be a delay in order for a very shocked Zanu PF to re-organise and decide what to do. Zanu PF had to prepare for a run off as well as provide the grounds for a run off. After a short hiatus, the strategy emerged, and a well-worn strategy it was, quite apart from the delay in announcing results. (We will return to the results later). The first move was to re-invent the "land" gambit, and, after announcing that white farmers were rushing back to claim their farms, the "people" began to invade the remaining 400 farms. By all accounts, these invasions have been more violent and intimidatory than those between 2000 and 2005, even worse than 2000 or 2002. This was the public strategy, but it was accompanied by an even more sinister strategy, one that had also worked in 2000 and 2002, and this was the unleashing of the militia, under military supervision - but more blatant military supervision than has been the case previously. As in 2002, the violence had the purpose of retribution for voting against Zanu PF, for, as in 2002, it was evident, but more so in 2008, that rural people had voted against Zanu PF. But in 2008, it also has the purpose of driving out any vestige of the MDC form the rural areas, and obviously handicapping the MDC in any preparations for a run off. Whilst all this was going on, there was still the problem of engineering a re-run, and this was much more problematic for the results published by ZEC for the Senate, and the House of Assembly seemed valid and reliable according to a number of independent estimates, including the MDC. ZEC did not and has not announced the Local Government results, but Justice Chiweshe has claimed that there is no need to as they were already published at the Ward command centres. As an aside, this is highly contradictory given that ZEC felt the need to publish all other results, and to "scrupulously" ensure that the results of the Senate, the House of Assembly, and the Presidency were correct. Thus, a high old farce ensued. The House of Assembly results were announced over days and days, and eventually it emerged that MDC Tsvangirai had a majority, and that the opposition had an absolute, but not a constitution changing, majority. However, it was majority enough to suggest that the former opposition would now become the government, or there would be severe problems for Robert Mugabe, if he won the presidential poll outright, and Zanu PF in governing as a minority government. They would be unable to pass a Bill or even obtain the finance necessary to govern without the total cooperation of the "opposition." The farce then continued with the tedious announcement of the Senate results, and it emerged that the two groups, Zanu PF and the MDC's, were even. commodities," information minister Sikhanyiso Ndlovu told reporters. commodities for a period of 90 days, with effect from 12 May." of politically motivated attacks are spreading. bounds. That evil will prevail. never get the story out and never get it right either. Southern Rhodesia. And that is where most of the violence is happening. write for mainstream media. Do we get information wrong? Yes, sometimes. won't or can't confirm or deny anything on their mobile or landlines. expensive for people to go "kumusha" (home). something to earn a little. ask questions carefully, nonchalantly, as if we are not really interested. through. But just in case, we have to be ready with a bunch of half truths. It is always "just in case". because the CIO (Central Intelligence Organisation) are smart. If they wanted to, they could catch all of us all the time. forgetting that Zimbabwe is, more or less a police state. Rautenbach. So no frightening overhead noise. heroines who do far more than we to ensure the story gets out. that body counts are bad for business. can usually name their assailants. planks, rope, bicycle chains, nails, everyday objects. ten days ago in one village about an hours drive north-east of Harare. their wounds to discover how they died. relatives. Maybe under a tree, a small heap hidden by tall grass. quietly among the huts in the bush because people are poor and fearful. been taken, their offices wrecked. how they survived the 2008 elections. batteries to keep everything else going. Is this generation of South African journalists flaky or leaderless? to make documentaries about Steve Biko. January 11, its not a crime to be a journalist, even if you are foreign. So why don't you come up north and tell the story? Please. Zimbabwe's deep political divide has spilled over into the religious arena. The pews which would normally play host to 1,000 worshippers held just 42 people on Pentecost Sunday, giving a melancholy feel to the huge building. Zimbabwe's Anglican women normally look resplendent in their white and blue uniforms, singing joyous praise to the Lord. But none of Sunday's worshippers were wearing any uniforms. Even the singing, which was accompanied by traditional drums was dull and could have been mistaken for funeral dirges. Outside the church, three armed policemen sat on a park bench directly opposite the entrance to the cathedral. They have become a permanent feature at Sunday services since Zimbabwe's Anglican Communion split last year, resulting in violent clashes between worshippers loyal to Bishop Nolbert Kunonga and his rival Bishop Sebastian Bakare. Bishop Kunonga is a staunch supporter of President Robert Mugabe and once described Zimbabwe's leader as a "prophet of God". He was dismissed by the church's regional leaders last year and says he is being persecuted by the global church leadership for his opposition to the ordination of gay priests. But Zimbabwe's opposition says the government installed him to stop the church criticising human rights abuses. Church regular Locadia Mutandiro says she is extremely disappointed by what is happening at the cathedral. "The house of God has been turned into a boxing-ring by politicians," she said. "The last time I attended service in March, we were only a few church-goers, as many prefer to go elsewhere to avoid being victimised by state security for supporting the Bishop Bakare group." The Church of the Province of Central Africa (CPCA) sacked Bishop Kunonga last November after he resisted pressure from the Anglican leadership to criticise Zimbabwe's government. But he refused to step down and has been accused of using young thugs allied to Mr Mugabe's ruling Zanu-PF party to attack the rival faction. The police have been accused of taking sides in the dispute, by beating up worshippers, including women taking the Holy Communion. Last month, the Anglican church leadership strongly criticised the situation in Zimbabwe following the disputed March elections and how the local church had been affected. 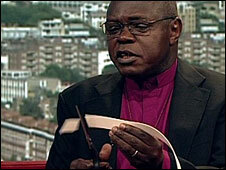 Archbishop of York John Sentamu said President Robert Mugabe was "living on borrowed time". He famously cut up his dog collar live on television and vowed not to wear it until Mr Mugabe left office. Such statements will not have gone down well with Bishop Kunonga. He says he is being persecuted by the global church leadership for his "principled stance on homosexuality in the church". President Mugabe is also virulently opposed to gay rights. Bishop Kunonga says western groups in favour of ordaining gay priests are funding his rivals to gain support for their position in Africa, where many church leaders take a traditional view. Moreblessing Mutare, a young father of two who belongs to the Bishop Kunonga faction, was very abusive when asked to comment on what was going on at the church. "You journalists are fuelling this whole thing. I won't speak to you again. Our Bishop [Kunonga] is right on the issue of homosexuals, but you want to make it as if he has done something wrong. If you read the Bible, it condemns homosexuality. That is our position," he said. 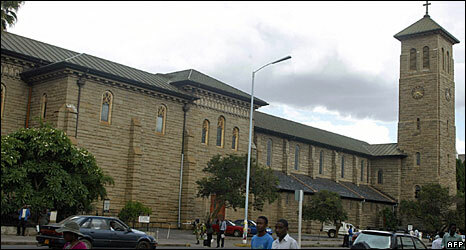 Following the split, the High Court ruled that the two factions should share the church's property and hold Sunday services at different times. The mood at the church varies according to which groups holds the service, says Musafare Chiraga, who attends service every week. He said the attendance for Bishop Kunonga is boosted by members of the state-run National Youth Service, known by some as the "green bombers" and accused of being a pro-Mugabe militia. "The happy and peaceful mood has disappeared as people are apprehensive about what can happen any time since the clashes began," Mr Chiraga said. The dispute spilled over into violence just after Christmas last year. Rival groups fought running battles at the St Andrews parish in Harare's Glen View district. Then in February, the Deputy Sheriff had to use a bolt-cutter to break in to the cathedral after followers of Bishop Kunonga defied the court order and barred their rivals from using it to conduct their service. Police were summoned and they took leaders of the two camps to the police station to try to find an amicable solution. But to no avail and the legal wrangles have now been taken to the Supreme Court. Church regulars say the majority of the congregation backs Bishop Bakare, while Bishop Kunonga enjoys the support of the state. As Zimbabwe awaits the date of a run-off in the presidential election, some say this mirrors the situation countrywide. The contributor's name has been changed for his own safety. international election observers, the Catholic Church in the region said. current environment is not conducive to free and fair run-off elections,"
accounts of systematic intimidation, violence and torture. Veterans, Youth Militia and plain thugs." run-off election whose date is yet to be announced. Zimbabwe to its rightful place in the family of nations." Police said two people have been killed and 40 others injured. Police have arrested 38 suspects on charges of murder and attempted murder. because foreigners are accused of "stealing" jobs. residents of contributing to the country's high crime rate. In April, shacks belonging to Zimbabweans were looted and set on fire. information about economic and social opportunities. The city will, on 25 May 2008 celebrate Africa Day. sowing seeds of division not very different from our racist apartheid past,"
rigged results, it still shows that 59 % of Zimbabweans voted Mugabe out. The figure is probably far higher. the academic sense. The proof is in the pudding. holds no emotional power over them. They want what the 1st world wants. and crops don't just grow themselves. take the reins. The culture of corruption has a stranglehold on Zimbabwe. This evil can take years to eradicate. It has proved the ruin of Africa. buried and forgotten for all eternity . long time. There has been little or no encouragement. act like losers and fear is their one and only remaining weapon. dishonour those that have suffered so much. now, and is certainly the most notable of the 21st century thus far. future and be able to say "we did our best"? together, for everyone's sake and fight and not give up! in that victory and WILL win! who find the courage to stand shoulder to shoulder with them. militia cashing in their pay or reward. them. One of the young boys Jerry Tolivaripi had to be hospitalized at St.
Reports say that many people have left this area for the towns and cities. they do anything to prevent it. never had an election at all. bringing desperately needed food, fuel, medicine and stability. intimidation and retribution which has engulfed our countryside. wearing army uniforms. They have been accused of voting for the opposition. because losers simply won't accept defeat. now come home and see for himself the hell his supporters are enduring. to Zimbabweans as well as many parts of the world, they deserve better. offer them a chance to start over in a new home is peace and security. Billions of dollars raised for African famine relief by celebrities Bono and Bob Geldof have instead funded civil war across the continent, says terrorism expert Dr Loretta Napoleoni. London-based Napoleoni, in Auckland to appear at the Writers & Readers Festival, has written two books, Terror Inc: Tracing the Money Behind Global Terrorism and Insurgent Iraq: Al-Zarqawi and the New Generation, on the economics of terrorism. Her latest book, Rogue Economics, studies the destabilising effect of economic globalisation, focusing in part on why more than half a trillion dollars worth of aid sent to Africa since the 1960s failed to reach the intended destination - developing the nations' economies. That huge amount of aid, which includes money from the United Nations and donations generated by Live Aid for Ethiopia, organised by Geldof, and the Live 8 concert in 2005, organised by Bono, has instead "served as a rogue force, notably as an important form of terrorist financing" in countries such as Ethiopia, Somalia, Sudan, Zimbabwe, Tanzania and Kenya. Ethiopia, for example, received $1.8 billion in foreign aid between 1982-85, including a large contribution from Live Aid; $1.6 billion of that, she points out, was spent on buying military equipment. "The money has ended up making Africa poorer and more violent because the money has been diverted towards warlords, weapons and armed invasions," she says. "The problem of Africa is corruption." Napoleoni says there are parallels with Burma in the aftermath of the cyclone as aid organisations appeal for donations. "What is happening in Burma is a good example. You can have the best intentions but getting the money to the people in need is very hard because you have to go through the bureaucracy. The problem is the governance. You also need expertise. What the international relief organisations are saying is, you should send people from our team who know exactly what to do in these circumstances." The cult of celebrity means that people who are famous for nothing more than being pop or movie stars speak out on issues they don't fully understand. "People like Bono and Bob Geldof are not ill-intentioned," she says. "But the simple fact that being a celebrity puts you in a position above everybody else is unacceptable. "These people don't realise they are being manipulated by politicians and others. That is the case in the relationship between Bono and [American economist] Jeffrey Sachs, who is among the people who caused the chaos of the transition of the former communist countries into free-market economics. Sachs has been trying to relaunch himself as a sort of economist celebrity so he has been linking himself to Bono. "Bono is repeating what he has been told about Africa. I am sure Bono hasn't got a clue about economics." Napoleoni, who knows Geldof as a neighbour in the London suburb of Battersea, says he told her the first Live Aid was the "worse experience of his life because he found it very difficult to control where the money went. He suddenly realised it's easy to put famous musicians together to make money but to bring the money to the people in need is another matter." Napoleoni adds that there is a certain amount of hypocrisy among stars linked to good causes. Nobel Peace Prize-nominated Bono and the other members of U2 were last year outed as tax-evaders for diverting their funds to the Netherlands, circumventing their democratic responsibilities to their home country of Ireland. And Brad Pitt, Napoleoni points out, may drive a hybrid car, but he and Angelina Jolie use a private jet. Their trip to Namibia a couple of years ago, she notes, burned up enough fuel to take Pitt's hybrid all the way to the moon.